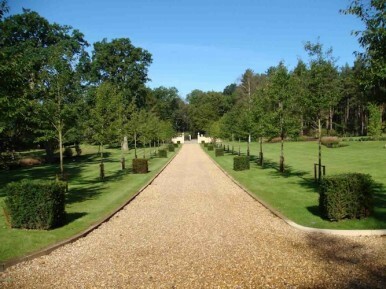 These groundworks consisted of the redevelopment of a two acre entrance and driveway. A new drainage systems had to be installed, along with a rain water harvesting to irrigation system for the supply of water to the new planting scheme proposed. Extensive earthworks were undertaken with the importation of over two thousand tonnes of topsoil being re-graded to new levels and contours. We designed an extensive planting plan that included a large number of semi-mature trees, shrubs and over 300,000 multi-species bulbs. We had to achieve the project within a specific time window due to the number of bulbs and the onset of winter weather. PC Landscapes are happy to tender on any commercial project, please contact us.